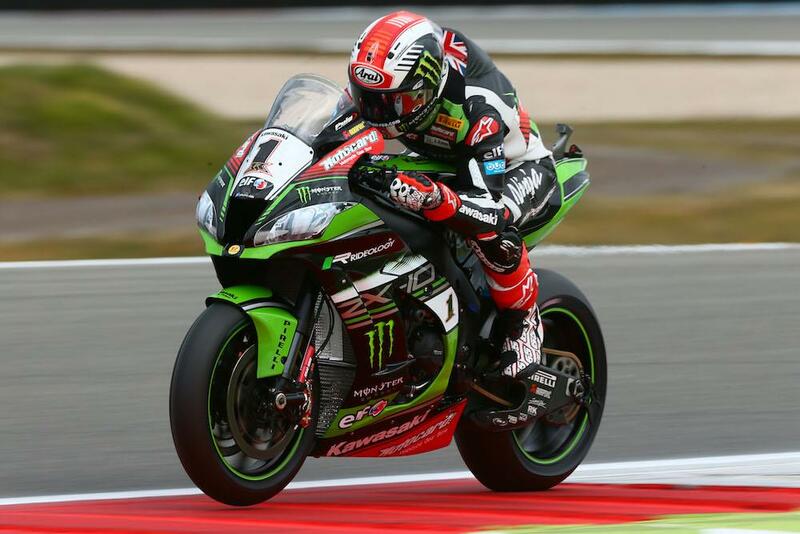 Jonathan Rea (Kawasaki Racing Team) won the first race of the Assen weekend after his closest championship rival Chaz Davies (Aruba.it Racing - Ducati) lost his chance of any kind of podium, with just one lap to go, when his bike broke down entering the main straight. 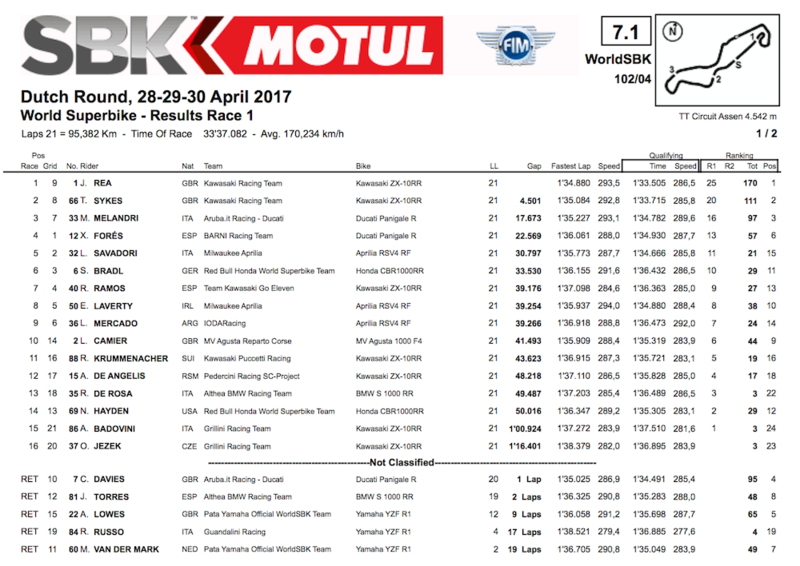 The closely following Tom Sykes (Kawasaki Racing Team) was promoted to second and lonely fourth place rider Marco Melandri (Aruba.it Racing - Ducati) suddenly took third place on the podium. A great start from Chaz saw him take the lead, with Sykes fighting back and Rea, from fourth place, up to second before the end of the first lap. Local hero Michael van der Mark fell at turn five trying to get back into contention. Rea left the first day with a new lap record of 1’34.880, set on lap three. Xavi Fores (Barni Racing Ducati) was fourth, Lorenzo Savadori (Milwaukee Aprilia) fifth and in a great result for the troubled Honda team saw Stefan Bradl (Red Bull Honda World Superbike Team) sixth – and thus a front row starter for Sunday’s race. Roman Ramos (Team GOELEVEN Kawasaki) had an excellent run to seventh, Eugene Laverty (Milwaukee Aprilia) went eighth after Leandro Mercado (IodaRacing Team Aprilia) was put into ninth - after cutting a chicane and being dropped back from his original on track finishing place. The top ten was rounded out by Leon Camier (MV Agusta Reparto Corse). Michael van der Mark (Pata Yamaha Official WorldSBK Team) crashed out of his home race, having lost out significantly on the first corner after contact with Alex Lowes (Pata Yamaha Official WorldSBK Team). Lowes would also fall and no score. Nicky Hayden (Red Bull Honda World Superbike Team) was 14th after slowing on the final lap. In the championship Rea now leads Sykes by 59 points, with Melandri now in third 73 points from Rea. Davies is fourth, some 75 points down on Rea.